WHITEFISH BAY -- A Whitefish Bay mother of two says the pain she felt during her heart attack, was worse than childbirth. Yet, she still hesitated to call 911. Thankfully, she did. Kim Christenson is sharing her story, to make sure women don't miss the warning signs. This may include how you sleep. The 57-year-old yoga instructor shared what stopped her in her tracks while working out at home about two years ago. She had a heart attack known as 'The Widowmaker.' Her left anterior descending artery was blocked. "A feeling of being torn someone with giant claws tearing at my chest, tearing at my back down the length of both arms," Christenson described. Cholesterol was the culprit for her. She says her's was 260 at the time. Normal cholesterol is less than 200. She says her doctor put her on a low percentage risk because of her healthy lifestyle. "Begin a conversation about this," urged Christenson, "Do you want to end up being in that small percentage of the people who come close to dying or do die? There's no reason." 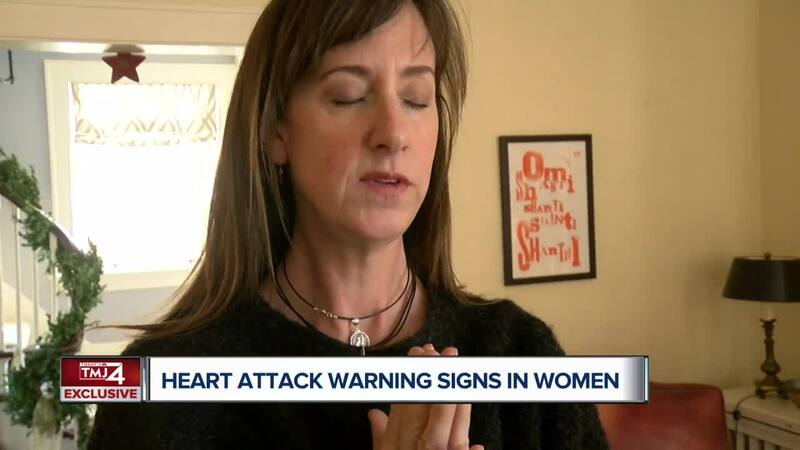 She is now an ambassador for The American Heart Association to get the word out on warning signs in women. Another sign of heart trouble not related to her case, is sleep apnea. Sleep specialist Dr. B. Tucker Woodson with Froedtert & Medical College of Wisconsin says when your body stops breathing during sleep apnea, it can trigger a 'flight or fight' response. This can stress out your heart over time. "It's the night after night, month after month, year after year exposure. So you see the risk in sleep apnea occur over five, 10 or maybe 20 years," explained Woodson. Woodson says poor sleep can also affect your heart. Getting as little as five hours of sleep a night can have huge consequences. It is always best to talk to your doctor first to find out what's best for you and your family's health.